Whether you're upgrading the trim of your siding or you're looking to replace your home's exterior with a strong performance metal, Alcoa siding offers options in a range of price points. Envoy Aluminum Siding: With no paint and no hassle, this rigid aluminum siding with a nominal .024 thickness offers strength and beauty for years to come. Endurance Aluminum Siding: With a nominal .019 thickness and a wind rating of up to 165 mph, choose from Double 4" or Double 5" Dutch Lap in your choice of eight colors. Gutter and Downspout Coil: Alcoa products include trim and downspouts that are sustainable, recyclable, and strong. The proprietary Alumalure 2000 finish puts the perfect touch on Alcoa products. Many products are available in the DreamColor palette of over 700 colors, meaning you can truly customize your home's exterior to your preferences. Alcoa siding products are sold through Mastic Home Exteriors by Ply Gem, which is headquartered in Cary, North Carolina. Products available through Ply Gem include aluminum siding, trim sheet, soffit, and rain removal products and accessories. 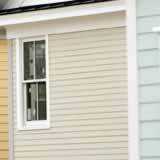 Mastic Home Exteriors products include 16 vinyl siding choices in a full range of colors, shapes and styles.